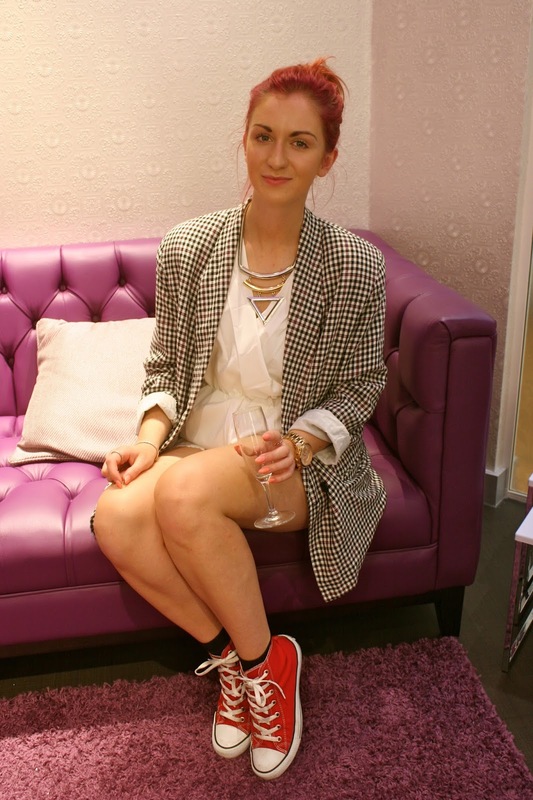 We spent an afternoon at Intu Lakeside for a free personal stylist session. Last weekend we paid a visit to the Personal Stylist lounge at Intu Lakeside to meet Carlene Noel for some style inspiration. The all new lounge is located in the new customer area on the first floor of the shopping centre. The area is complete with a sofa area with magazines making it a great place for shoppers to catch up with friends or a place for tired husbands/boyfriends to relax. You can even leave your phone here to charge! We booked an appointment at 12.30pm to meet with Carlene for a free two hour personal stylist session. Yes, FREE. A session with Carlene consists of a chat (around 30 minutes) so she can get to know you as a person before taking you shopping for up to 90 minutes and there is no obligation to buy anything. I fell in love with the room as soon I walked in. It’ beautifully decorated in my favourite colour with a gorgeous quilted sofa and fluffy cushions and funky lighting. It’s all very glamorous! I felt relaxed as soon as we entered, which is not what I expected. Before we got to the lounge I was anxious. I didn’t know what to expect and I didn’t want to feel intimidated. I’ve never met with a personal stylist before but when I have been to make up counters for advice, instead of being politely told the foundation shade I’d been advised to buy before wasn’t correct the MUA just made me feel completely embarrassed. It’s not the type of response you want from someone you have gone to for advice. I cannot express enough how comfortable we felt with Carlene. We sat down with a glass of Bucks Fizz each and chatted away with and before we knew it almost two hours had passed! Carlene is a London based fashion stylist and personal shopper and stylist and she knows her fashion (and her travel, I think I’ll be booking a holiday to Ibiza soon!). Carlene is very approachable and has extensive experience of styling including being a personal stylist at Selfridges and also working with celebrities on fashion shoots and music videos. Carlene Noel is the perfect person to visit for a bit of style inspiration no matter your gender, age or your style. She is full of tips on how to make yourself feel good in what you wear and it was fantastic to see that Carlene was so passionate about this. She told us that it’s all about making that person happy, as helping a person with their style can bring out a new confidence in them. It’s not always about being on trend, although Carlene can give tips on this, it’s also about wearing what suits your personality and your shape. This is what Carlene analyses during the consultation (which is more like a chat with a friend!). She said she can walk into a store and see an outfit and think ‘that suits their personality’. It may not necessarily be something that person would normally pick out but it could find a new style for that person that they wouldn’t of imagined wearing before. You can really tell Carlene loves what she does and is there to help people. It’s important to feel comfortable with a stylist otherwise you will not be making the most of the experience and Carlene is very good at making you feel like you are just chatting and shopping with an old friend! The room has a outfits on show from shops in the centre for inspiration. I fell in love with the pinstripe playsuit above which I went searching for later that day but sadly it was sold out! Carlene and Intu have put together a few packages for shoppers to choose from. These are available 7 days a week including evenings and weekends which is perfect for shoppers like me who work 9am-5.30pm. Are you going to be the Mother of Bride/Groom? A wedding guest? Need a birthday outfit? Have a Job interview? Attending a Christmas party? This package is ideal if you have a special occasion approaching and are in need of 1 complete outfit. Carlene sees a huge variety of customers, male or female, young or old. Carlene meets a lot of women who have had a change in body shape over the years which means they’ve lost their confidence and do not know what to wear. The service is a great boost for them, it’s something they may not have considered trying before but are so pleased once they have. Also Carlene’s passion is menswear fashion so this service isn’t just for the ladies! The stylist lounge also offers fragrance testers and will be running make up events over the next few months so keep an eye out on Carlene’s Twitter for more info. Carlene can help you find an outfit for any occasion. For example her most recent clients include those looking for outfits to summer proms, weddings or birthdays. She also sees a few couples coming in, it may start with the male customer not being interested in a styling session but by the end of it they are loving it! It’s experience you may not think you need or will enjoy but by having a free consultation, what is there to lose? Thank you Carlene for such a wonderful afternoon chatting all things fashion! All that chatting made us hungry so afterwards we headed to the food court and pigged out at Five Guys. We don’t drive so we travelled to Lakeside by bus from Greenhithe Station in Kent. If you are coming from London the nearest station is Chafford Hundred.